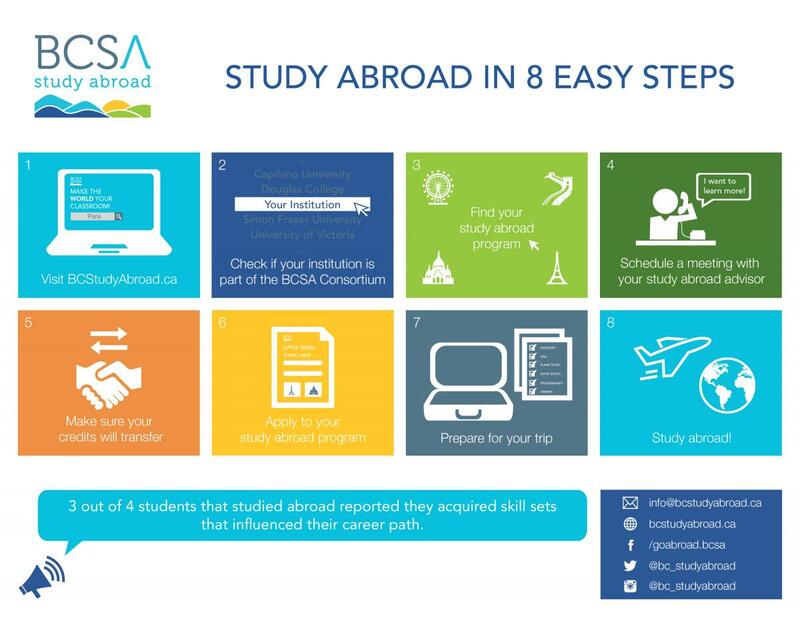 The British Columbia Study Abroad (BCSA) Consortium is a new and dynamic platform encouraging students from one BC post-secondary institution to attend another BC post-secondary institution’s study abroad program. The Consortium affords BC institutions from across the province an unprecedented opportunity to promote their own study abroad programs while fulfilling key goals towards internationalization and supporting best practices in student experience. Marketing Reach: Consortium member institutions can promote student abroad programs to over 350,000 students province-wide. Viability: Smaller and regional institutions can more readily offer study abroad programs thanks to province-wide marketing and exposure. Scholarship: Students can access scholarships available only to Consortium institutions. Diversity: The Consortium promotes diversity amongst study abroad participants. If you have additional questions about the consortium, or are an institution interested in joining this group, please contact us at info@bcstudyabroad.ca. Note: Only short-term opportunities are included on bcstudyabroad.ca. Need to update your program information on this site? See our How-to Guide.